In which we travel to the border. One night long after I had answered the beeswax-negative-ions question and delved into so many far-flung wax stories from ozokerite’s “Gunplay” Maxwell’s shoot-out to adipocere’s Granville’s mummy, I was in bed reading an article in The New Yorker about a canoe trip along the Mexico-U.S. border. On the trip were the article’s writer, Nick Paumgarten, and, among others, a U.S. senator, a Roosevelt, and a groover. The group paddled down the Rio Grande, and, floating off here and there, Paumgarten paints an interesting kind of boots-on-the-ground, paddle-in-the-water reality in which to set this idea that some have of building a sky-high wall along the U.S. side of the river. The article points out that this would effectively change the southern border of the United States, and notes that already land owned by the National Butterfly Center has been bulldozed for the wall, without due process, let alone the group’s knowledge, but what really caught my eye was a paragraph about wax. He pointed to the shrubs that cling to the base of the steep cliff: candelilla, a source of wax used in the production of lip balm, candles, religious figurines, and chewing gum. A hundred years ago, there was a Great Wax Rush here, with factories on both sides of the river, but now it’s a small-time affair. He described how people on the Mexican side rip the shrubs out of the soil, boil them with sulfuric acid in vats at a camp downstream, skim the wax off the surface, and then transport it by donkey out of the canyon, up to the mesa and into Boquillas. On a good day, a candelillero can produce about ten dollars’ worth of it. “It’s either that or running a ferry,” McDonald said. I bet at the time I searched online for “candelilla wax” and got, as I did recently, a bunch of ads for candelilla wax. And, I swear, so often the results of an Internet search feel like being thrown into a 1970’s shiny new, slick, generic, boring behemoth of a suburban shopping mall that traps you inside until you are lost and confused, standing there glassy-eyed staring at this candy-colored map that tells you “You are here,” a little dot amid all the crap, and all the good stuff—the museums, libraries, antique shops, resale shops, and just plain old quirky shops—are all downtown, where everybody’s afraid to go and the bus no longer runs, and, anyway, you forgot what you came in for. The process of separating the wax from the plant is simple yet arduous. 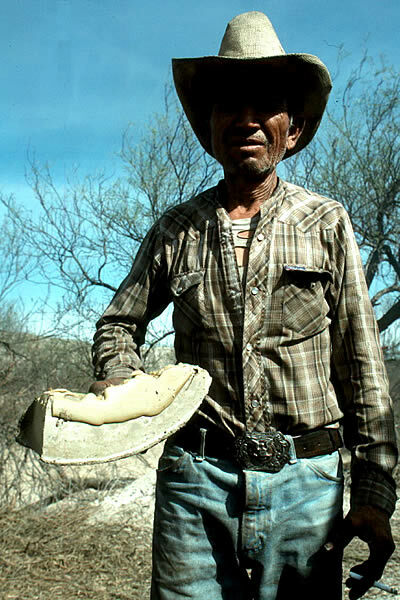 Paumgarten neatly sums it up, but Texas Beyond History provides detailed descriptions of the candelilleros and their camps, their burros, their burlap bags and buckets, their vats and firepits. In Tunnell’s time, the camps were primitive. —a story of pesos sewed into a burlap bag, flung from an airplane; an account of the regulations and controls that developed over time on both sides of the border; the raids and the border patrols; and, of course, descriptions of the wild, weedy plant it all stems from. 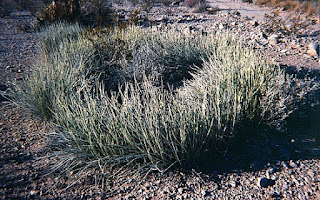 As it happens, when cultivated, candelilla produces very little wax. It seems only in the wild will it produce what we want. which has hardened in a barrel. At the time I was reading about candelilla wax and the candelilleros, the United States Border Patrol was taking children from their parents as they attempted to cross into the U.S. This activity was dominating the news and causing an uproar among those who believed the separation harmful to both children and parents as well as society at large. Was it a moral issue? A pragmatic issue? A legal issue? A political issue? All of the above? In essence, as I saw it, poor families venturing far from home in search of a better life—meaning, simply, a modicum of safety, work, education—were being destroyed. Although the United States can, at times, be a benevolent place, sometimes it is just the opposite, and often it seems any benevolence there may be is meted out based on skin color, on background, on wealth, on education, on who your parents are. In other words, each of us has a perceived value based on a tradition of exclusivity and bigotry. We know that historically a person without property is perceived by those in power as having less value than those with property. We know that historically a person with a darker skin color is perceived by those in power to have less value than a person with a lighter skin color. We know that historically females are perceived by those in power as having less value than males. And we know that those who yap loudest and longest about “family values” are often the first to disregard families that they perceive to have little value or no value especially when those families are perceived also to be posing a threat … to what, exactly? Well. I can’t tell you how many people have either eked out a living or amassed a fortune from the wax of the candelilla plant; nor can I tell you how many have enjoyed candelilla wax in one product or another. But I’m guessing I have enjoyed candelilla wax, and maybe you have, too, not that either of us would have been aware of which product it was in, or how it came to be there. … for there is no folly of the beasts of the earth which is not infinitely outdone by the madness of men.